It feels like it’s been a while since I’ve been able to take a breath and update what feels like one of the ten million things I’ve been up to. Whether it be covering the Trenton Titans, Princeton Tigers or any of the various MLB and AHL assignments I’ve been on since the Thunder season came to a close, I’ve certainly kept myself busy. It was in the early morning hours of June 12, 2012 that I thought perhaps I’d covered my last game. I was a few hours removed from having been on the ice interviewing Los Angeles Kings players after they’d won the Stanley Cup, and it was then and remains now the greatest thing I’ve ever been a part of in my ten-year career. I knew I wasn’t going to be able to top it, and have always felt like there was a lot to be said for going out on top…and while I’m hardly “on top,” that feeling was as close as I felt I was going to get. So I considered making Game 6 of the 2012 Stanley Cup Finals the last game I ever covered. But, while stretched out on top of several wildly uncomfortable chairs at LAX waiting for my long flight back home, I had plenty of time to think about that decision. I’ve covered the Thunder since 2004, but really since 2006…and well, really since 2008. I did a handful of games as a photographer my first two years, then took over the beat in 2006. But it was this blog that changed everything for me in 2008, and provided a lot of the opportunities I’m able to take advantage of today. I also thought about this year’s team, and how they’d made it fun again for me. I hate being in a clubhouse. Hate it. I will always believe that reporters should have access to it, but there’s always that feeling of being in their space and not always being welcome, so it’s always an uncomfortable feeling for me. Part of the job, but it doesn’t mean I have to like it. But this was a fantastic group of guys to cover this season, and it was great being around those guys regardless of the setting. I thought about the friendships I’ve made and relationships that I’ve been able to cultivate over the past nine seasons…and I wasn’t ready to give all of that up yet, despite what would perhaps be my better judgment. I will be 30 when the 2013 season starts, and this is by no means a guarantee that I’ll be able to return…I’ve done so much with so little, and I’m proud of that. But I can’t keep doing this without generating a significantly bigger income, which can get me out of my roommates’ house (see: my parents) once and for all. I’ll be able to afford a car, the insurance for it, and a place for me and my surprisingly cute girlfriend, Candice, to live in. I’m grateful for what I do have and the people I have around me, but I have to do better…and there is going to come a point, whether I go out “on top” or not, where this isn’t going to be my best option. But, right now, it is. I’d love to come back next season, and if that’s realistic, you’ll see me in the press box on Opening Day. I may not necessarily have the biggest smile on my face, but you shouldn’t take that as an indication of whether I’m happy or not…most people in there rarely see me happy anyway. There are — this is a thank you post, after all — some people I need to thank. I could not do this job without Bill Cook. I have been so incredibly blessed to work two of the best media relations people in the business in Bill and Somerset’s Marc Russinoff, and I absolutely would not be where I’m at without the efforts of either. Bill is an incredible nice guy who will go so incredibly far out of his way to take care of you, and his work…both visible and behind the scenes, should serve as a model for how people in his position should do their jobs. I also need to thank Jay Burnham and Josh Maurer, both tremendous people as well as exceptionally talented radio guys…was always enjoyable hanging out with them on the road, and Trenton is very fortunate to have two people as professional and fun to be around as they are. The Thunder front office is always a blast to be around — yes, even Eric Lipsman when he chirps me on Twitter, which is usually in good fun anyway — and I thank them for opening their stadium to me for another season. My press box colleagues — especially Josh Norris and John Nalbone — should be thanked not only for putting up with me for another season, but their help, friendship and guidance along the way. But I literally cannot do my job without the cooperation of the players and coaching staff, and as I said earlier, they were truly fantastic to deal with this season. Special thanks to Tony Franklin for now having put up with me for six years. And, to my readers…thank you. I certainly don’t do this for myself…this is for you. The blog — advertising and sponsored posts aside — is a labor of love. I enjoy reading the comments and e-mails I get from all of you, and hope to see you all next season. If you’re interested in sports betting, you can read more by clicking on that link from one of my handy dandy sponsors. My thank you post will be ready to go in several days…but outside of that, please keep in mind that I’ll have features on Adam Warren, Francisco Cervelli, Mark Melancon and Melky Mesa on here in the coming weeks. I hope you all also enjoyed my coverage of the sure to be over soon run of the Yankees in The Trentonian. I was particularly proud of my feature on Joe Girardi coping with the unimaginable loss of his father, which you should definitely check out if you haven’t already. Until baseball’s back — at least for me, anyway — please check out my coverage of the Trenton Titans at Inside The Trenton Titans. You can also read my national hockey coverage for The Trentonian at 5 For Writing, and my work for the ECHL as their national alumni feature writer will continue at ECHL.com as well. Would also encourage you to come out to the Sun National Bank Center to check out a Titans game as well. With the extremely unfortunate situation given the lockout, a lot of the top Flyers prospects have joined Trenton for the season, and the team has gotten off to a 4-1 start. I’m serving as The Trentonian’s beat writer for the Titans this season, and you can look for my stories either in print or on the web after every game. My coverage of the Princeton Tigers men’s hockey team will also be available at the very least at 5FW, and hopefully some games will be in print as well. 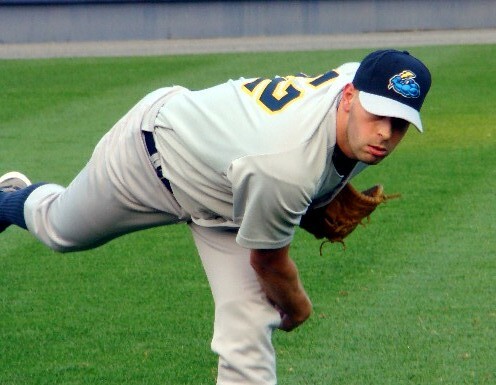 BRONX, N.Y. — With everything David Aardsma had been through in the past two years, it would be hard to blame anyone that doubted he could get back to the big leagues this season. The 30-year-old righty reliever had strung together two excellent seasons for the Seattle Mariners, saving 69 games between 2009 and 2010. But he underwent hip surgery following the latter season, and then had to have Tommy John surgery in June of 2011 during his first comeback attempt. Then, while rehabbing this June, Aardsma felt discomfort in his surgically repaired elbow, and was shut down from throwing in any meaningful games for nearly two months. Thankfully, the third time was a charm. The endlessly friendly Denver native rehabbed with the Thunder during their playoff run, appearing in five games. He improved dramatically as his stint went on, and ultimately pitched to a 3.60 ERA in five innings of work, getting out of some self-created jams in the process. Today at Yankee Stadium, I had the chance to speak with Aardsma about his return to the big leagues and just how he fit in so well with his Trenton teammates during his stay. Mike Ashmore, Hunterdon County Democrat: It didn’t always seem like a foregone conclusion that you’d actually get back to pitching in the big leagues at the end of the season after leaving Trenton. How realistic did you think it was that you were going to be able to get this opportunity? HCD: It seemed to me at least that you really progressed in your outings at Trenton. Do you feel like you still have a litle ways to go before you get to 100 percent? HCD: You really fit in really well with that Thunder team, whereas you see a lot of other rehab guys kind of stay sheltered away from everyone else. Did you make a conscious effort to do that? HCD: After everything you’ve been through, to get into that big league game the other day, what did that mean to you?